WASHINGTON, D.C. - In cooperation with the U.S. Consumer Product Safety Commission (CPSC), Makita U.S.A. Inc., of La Mirada, Calif., is voluntarily recalling about 350,000 electric orbit sanders. The pads on the sanders can break apart during use and strike the operator, posing an injury hazard to consumers. Makita U.S.A. Inc. has received 13 reports of pads coming apart, including three minor injuries that resulted from pieces of the pad striking consumers. The recalled sanders include the BO5000 and BO5001 model numbers, which can be found on the silver nameplate on the sander's body. The sander's housing is blue and the name "Makita" appears in large white letters on the motor housing. These sanders were manufactured in the United States. Home centers, hardware stores, and industrial suppliers nationwide sold the sanders from April 1992 through February 2003 for between $110 and $125. Consumers should stop using the recalled sanders immediately and return them to the nearest Makita factory service center for a free repair. For more information on how to return the sanders or to locate the nearest Makita factory service center, consumers should contact Makita at (800) 462-5482 between 8 a.m. and 4:30 p.m. Monday through Friday or log on to the company's website at www.makitatools.com. Distributor: Makita U.S.A. Inc., of La Mirada, Calif. Hazard: The pads on the sanders can break apart during use and strike the operator. 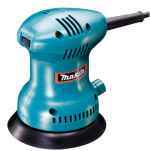 Incident/Injuries: Makita has received 13 reports of the sanding pad coming apart. There have been 3 reports of minor injury. 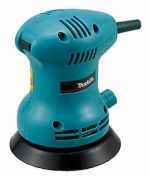 Description: The recall involves Makita BO5000 and BO5001 Electric Sanders without the letters "PUR" on the pad. No other Makita sanders are involved in this recall. Any BO5000 or BO5001 sanders with the letters "PUR" on the pad are not involved in this recall. 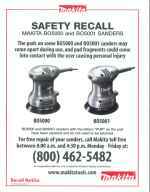 Remedy: Consumers should stop using the recalled sanders immediately and return them to the nearest Makita factory service center for a free repair. For more information on how to return the sanders or to locate the nearest Makita factory service center, consumers should contact Makita at (800) 462-5482 between 8 a.m. and 4:30 p.m. Monday through Friday or log on to the company's website at www.makitatools.com. Consumer Contact: For more information, call Makita toll-free at (866) 714-3860, Ext.232 between 8 a.m. and 4:30 p.m. ET Monday through Friday, or visit their Web site at www.makitatools.com.